From Wikipedia, the free encyclopedia Stephen J. "Steve" Ditko (born November 2, 1927) is an American comic book artist and writer best known as the artist co-creator of the Marvel Comics heroes Spider-Man and Doctor Strange. Ditko studied under Batman artist Jerry Robinson at the Cartoonist and Illustrators School in New York City. He began his professional career in 1953, working in the studio of Joe Simon and Jack Kirby, beginning as an inker and coming under the influence of artist Mort Meskin. During this time, he then began his long association with Charlton Comics, where he did work in the genres of science fiction, horror, and mystery. He also co-created Captain Atom in 1960. Ditko then contributed to Atlas Comics, the 1950s forerunner of Marvel Comics. 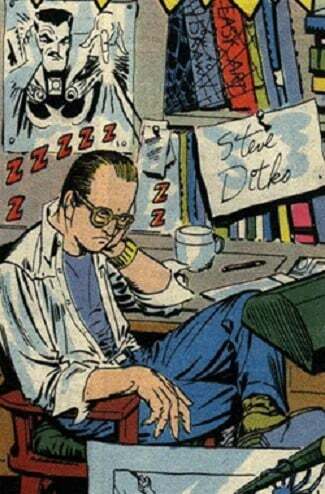 While Ditko contributed much highly significant work to Marvel, he is best known for being the first artist to draw Lee's Spider-Man, who would become the company's flagship character. Additionally, the following year, he and Lee co-created the supernatural hero Doctor Strange. Ditko also made important contributions to the Hulk and Iron Man. In 1966, after being the exclusive artist on The Amazing Spider-Man and the "Doctor Strange" feature in Strange Tales, Ditko left Marvel for reasons never specified. Ditko then worked for Charlton and DC Comics, making major contributions, including a revamp of long-running character Blue Beetle, and creating or co-creating the Question, the Creeper, and Hawk and Dove. Ditko also began contributing to small independent publishers, where he created Mr. A, a hero reflecting the influence of Ayn Rand's philosophy. Since the 1960s, Ditko has declined most interviews, stating that it is his work he offers readers, and not his personality. Ditko was inducted into the comics industry's Jack Kirby Hall of Fame in 1990, and into the Will Eisner Award Hall of Fame in 1994. Description above from the Wikipedia article Steve Ditko, licensed under CC-BY-SA, full list of contributors on Wikipedia.